Home > News > Watch live! Solar-powered plane takes off from AbuDhabi for its world tour. The Swiss powered solar plane took off from Abu Dhabi this Monday morning and will fly around the world without a single drop of fuel. 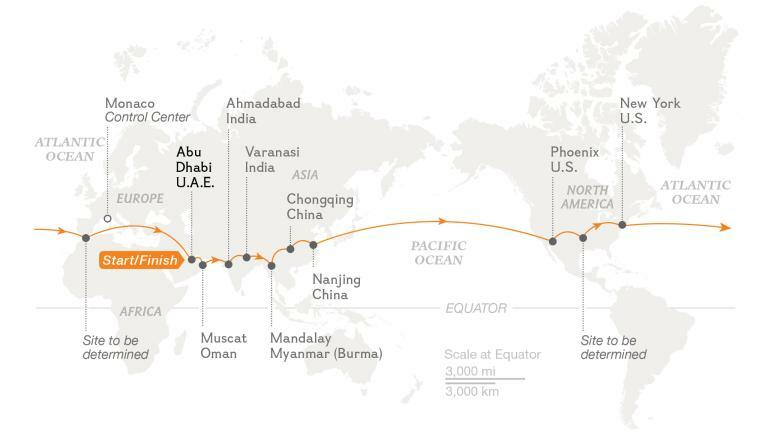 The plane is expected to reach its first destination Muscat, Oman after about 10 hours of flight. Later the plane will head to India, where it will have 2 stops. Later the plane will head to China and Myanmar before crossing the Pacific and will stop in Hawaii. Then it will head to Phoenix, Arizona, and New York’s biggest airport, John F. Kennedy International. The path across the Atlantic will depend on the weather and could include a stop in southern Europe or Morocco before ending in Abu Dhabi.